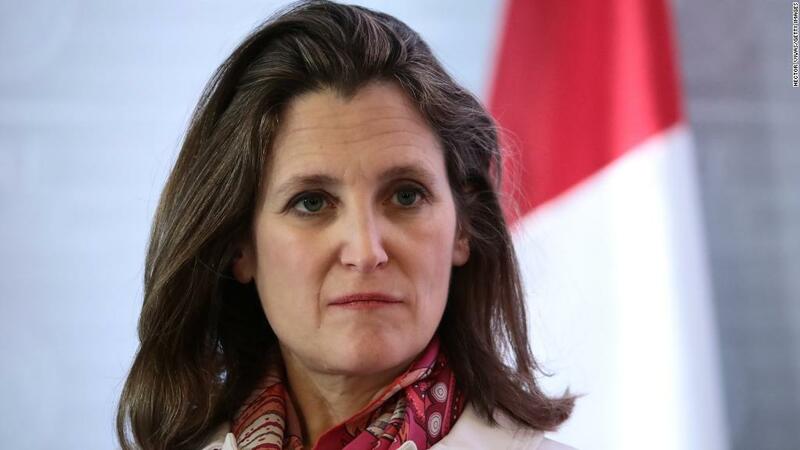 Canada's minister of foreign affairs has a message for the United States: "Please think hard about the message you're sending to your closest allies." Chrystia Freeland made the comments to CNN's Dana Bash on "State of the Union" Sunday after a week of heightened trade tensions. "This is a really sad time for us," Freeland said about the Trump administration's decision to extend steel and aluminium tariffs to Canada, the European Union and Mexico, all of which are close US allies and have each announced plans to retaliate. "We are hurt and we're insulted," she added. Freeland pointed out that the United States and Canada have "been working together for 150 years." "What you are saying to us and all of your NATO allies is that we somehow represent a national security threat to the United States," Freeland said Sunday. "Seriously?" Freeland said that the US actions are "illegal under international trade laws." Canadian Prime Minister Justin Trudeau has called the US's tariffs "totally unacceptable" and "an affront to the longstanding security partnership" between the states and Canada. On Sunday, Trump's director of the National Economic Council, Larry Kudlow, told Fox News's Chris Wallace that Trudeau is "overreacting." "These tariffs may go on for a while or they may not...But to say that this is an attack on Canada is not right," Kudlow said. "The point is, we have to protect ourselves." The comments come just after finance ministers from seven of the world's largest economies gathered in Canada over the weekend for what's known as the G7 summit. The summit is typically seen as a platform to laud the global economy, but trade tensions weighed heavily on the event. The United States faced a rebuke from some of its closest allies over Trump's trade policies. The six other finance ministers, without the United States, issued a joint statement Saturday, calling for "decisive action" following the Trump administration's decision to impose tariffs. Trump has repeatedly cited the national trade deficit as a sign that the United States is being treated unfairly by its international trading partners. "When you're almost 800 Billion Dollars a year down on Trade, you can't lose a Trade War! The U.S. has been ripped off by other countries for years on Trade, time to get smart!" the president said on Twitter Saturday. Trump also said in a separate tweet that "The United States must, at long last, be treated fairly on Trade." "If we charge a country ZERO to sell their goods, and they charge us 25, 50 or even 100 percent to sell ours, it is UNFAIR and can no longer be tolerated," he said. "That is not Free or Fair Trade, it is Stupid Trade!" Trump's tariffs could raise prices for Americans on a range of everyday products. And in his interview with Fox News, Kudlow, the presidential adviser, said it's possible that trade disputes could jeopardize America's stellar 3.8% jobless rate. He added, however, the Trump's tariffs are part of his effort to "rebuild" the American steel industry. "There's some early signs that that may be possible," Kudlow said. He said the Washington is "still welcome" to "good faith negotiations." The administration is separately moving ahead with tariffs on Chinese goods. On Sunday, China warned that Trump's plan to impose tariffs on $50 billion of Chinese exports threatens to wipe out progress made in trade talks between Beijing and Washington.